In Bermuda, Mouton Cadet makes debut as the Official Wine of 35th America’s Cup. This weekend in sunny Bermuda, exciting news was unveiled at the America’s Cup Village for discerning admirers of wine and sailing. Marking the debut of Mouton Cadet as the Official Wine of the 35th America’s Cup, yacht racing’s most thrilling event, Philippe Sereys de Rothschild and Sir Russell Coutts celebrate the new relations between the famous Bordeaux brand and the 35th America’s Cup. A perfect match. 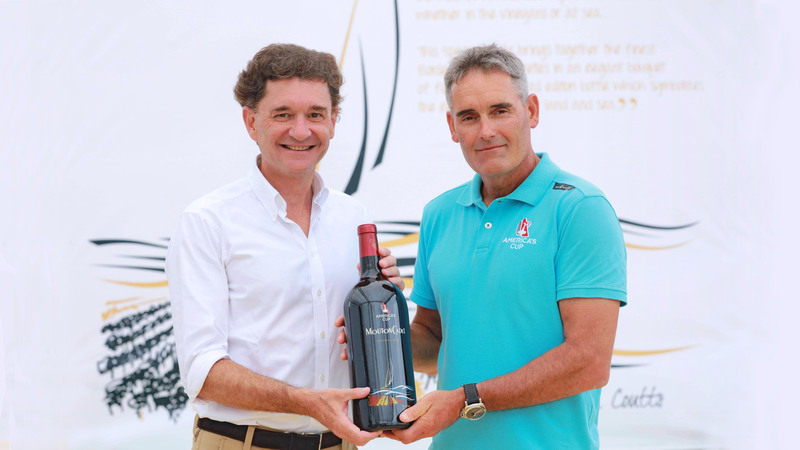 “I am delighted that Mouton Cadet, the worldwide Bordeaux brand, has entered this new partnership with the America’s Cup, the oldest and most prestigious sailing event in the world,” said Philippe Sereys de Rothschild of Mouton Cadet. Located in the America’s Cup Village at the finish line of the race, the Mouton Cadet Wine Cellar offers stunning views of the famed coastline. The America’s Cup Special Cuvée, unveiled at the event, will serve as the official wine of the month-long competition, scheduled to run from Saturday, May 27th to Tuesday, June 27th. The glass-etched design on the bottle was signed by Sir Russell Coutts, five-time winner of the America’s Cup. “I am thrilled to welcome Mouton Cadet aboard as Official Wine of the 35th America’s Cup and also pleased to have been part of the design of the Special Cuvée bottle. Depicting the parallel between the forces of nature at sea and on land, it perfectly underlines the unpredictable natural elements that the crew is facing when driving a race boat or the winemaker when confronted with a threatening storm over his vineyards. Both have to work with nature, interpret the conditions, plan their course and strive to achieve the best,” said Coutts. The limited edition red, white and rosé wines from Mouton are the perfect accompaniment to the sailing events, allowing wine lovers and sailing enthusiasts alike the chance to participate in one of the sport’s most prestigious events. “This partnership makes perfect sense: we are both international brands with a strong history, ours dating back to 1853, when my family took its first big step into the world of wine, just two years after the America’s Cup was founded. But, above all, the partnership with the America’s Cup celebrates the synergy between Mouton Cadet’s exacting standards and the high-level of rigor and dedication needed to compete in elite events,” Rothschild added. Visit the Mouton Cadet Wine Cellar, an amazing destination, in the heart of America’s Cup Village and enjoy a cool glass of rosé while enjoying the exciting yacht-racing competition. More to come from Bermuda, as Pursuitist attended the prestigious event this weekend and interviewed Rothschild and Coutts.